Many new terms, concepts, and teachings, were introduced to the Western world by H. P. Blavatsky and the Theosophical Movement which she founded at the end of the 19th century. The majority of these have in time become particularly distorted and desecrated, particularly amongst the many thousands of adherents of the New Age Movement. In other articles on this website, we have shown how the New Age teachings and ideas about the Masters, about Lemuria and Atlantis, about the Higher Self, about Karma and Reincarnation, and numerous other things, are a pale, unphilosophical, and twisted imitation of the pure teachings of Theosophy. 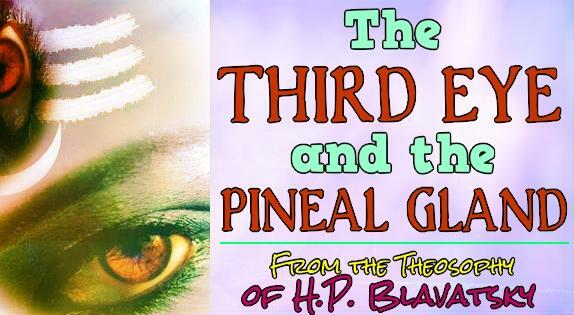 The current New Age obsession with the Third Eye and the Pineal Gland can also be traced directly back to its original presentation in the writings of HPB. Since so much confusion, misunderstanding, and dangerous misinformation exists on this topic, it was thought wise to put together the following excerpts from the Theosophical teachings, in order to show what the real Masters really teach about it. No respectable, reliable, trustworthy spiritual teacher would ever – under any circumstances – publish information and explanation on how to “awaken,” “open,” or “activate” the Third Eye. It is not the right time for this to happen and the many publications which exist in this regard can at best enable the individual to develop a few psychic faculties (which are not the same as spiritual faculties!) and at worst result in serious psychological and physical damage. The popular New Age idea that spiritual and especially occult development requires no self-discipline, no self-denial, no purity and holiness of life, is equally dangerous and has led thousands around the world into becoming black magicians without even realising it. There are actually very few individuals in the world who know the safe and true steps and procedures for awakening the many latent potentialities of the Pineal Gland and they will never say or write anything about this, as they are sworn to secrecy as part of their rules of initiation. Please note: The abbreviation “SD” below means “The Secret Doctrine” by H.P. Blavatsky. The “Third Race” refers to the Lemurian Root Race and the “Fourth Race” to the Atlantean Root Race. Our present Root Race or Epoch is the Fifth, known as the Aryan or Indo-Caucasian. (1) In Hindu esotericism it is called the Eye of Shiva, while in the esoteric Buddhism of Tibet and the Trans-Himalayan regions it is referred to as the Eye of Dangma. “ALONE THE ONE FORM OF EXISTENCE STRETCHED BOUNDLESS, INFINITE, CAUSELESS, IN DREAMLESS SLEEP, AND LIFE PULSATED UNCONSCIOUS IN UNIVERSAL SPACE, THROUGHOUT THAT ALL-PRESENCE WHICH IS SENSED BY THE OPENED EYE OF THE DANGMA. (2) The Third Eye was situated in the back of the head, not the front. It is only for illustrative purposes, and often out of ignorance, that it has been portrayed as being between the two physical eyes or in the forehead. (3) The Third Eye deteriorated, withdrew inside the head, and ceased to function, during the Atlantean Root Race, which is known as the Fourth Root Race. “THEN THE FOURTH BECAME TALL WITH PRIDE. WE ARE THE KINGS, IT WAS SAID; WE ARE THE GODS. “THEY TOOK WIVES FAIR TO LOOK UPON. WIVES FROM THE MINDLESS, THE NARROW-HEADED. THEY BRED MONSTERS. WICKED DEMONS, MALE AND FEMALE, ALSO KHADO (DAKINI), WITH LITTLE MINDS. (4) It remains latent and dormant within all human beings today, as the Pineal Gland. (5) It is neither safe, easy, nor necessary, for us to try to awaken and activate the Third Eye at this point in time…and to do so safely and properly requires the utmost purity and chastity of life. This is what Theosophy teaches and when we stop to think about the fact that it was the increasing materiality and sensuality of human beings that resulted in the obscuration and deterioration of the Third Eye and its faculties in the first place, it becomes plainly obvious that its reawakening or “re-opening” is dependent on the decrease of that materiality and sensuality on the part of the spiritual aspirant. Celibacy and chastity, as explained in the quote from “The Secret Doctrine,” are necessary rules and requirements for the safe and proper development of occult and psychic powers and the Masters require that those who have been accepted as their direct in-person disciples or chelas – in contrast with their “lay chelas,” those who still live and function in the world at large – must abide by this. But since we are not enjoined or encouraged by Theosophy to be trying to develop such powers at the present time and since the vast majority of us are not direct chelas (those who are, know that they are and do not have a moment’s doubt or query or wondering about the matter) we ought not to feel as though we are expected to become celibates, for this is not so. So let us fulfill our duties, our Karma and our Dharma, in the mode of life we find ourselves in now, resting assured that in years or more likely lives to come, the opportunities will come about for such practical occultism as leads to the opening of the Third Eye…provided that we have worked on preparing and fitting ourselves for such a thing. SOME RELATED ARTICLES: The Psychic is not the Spiritual, The Danger and Deception of Channelling, The Whitewashing of Black Magic, Theosophy: The Ancient Wisdom, 12 Things Theosophy Teaches, The Two Paths, Practical Theosophy, Meditation Advice, Helpful Hints for Spiritual Progress, Higher Kundalini and Lower Kundalini, 14 Good Reasons to reject the Alice Bailey Teachings, Who are you, Madame Blavatsky?, The Masters and Madame Blavatsky, Words from The Masters about H.P. Blavatsky, Responding to Lies about H.P. Blavatsky, Praise for H.P. Blavatsky and Theosophy, Gandhi on Blavatsky and Theosophy, An Invitation to The Secret Doctrine, Human Evolution in The Secret Doctrine, and How to successfully study the Teachings of H.P. Blavatsky. A very enlightening historical on spirituality.